Walter Lippmann (1889-1974) was the author of many books on political thought and was widely considered America's most distinguished syndicated columnist. In addition to being awarded the Presidential Medal of Freedom, he won two Pulitzer Prizes for his newspaper column "Today and Tomorrow," which appeared in the New YorkHerald Tribune. The following is a personality profile of Walter Lippmann based on his work. Walter Lippmann is shrewd and somewhat insensitive. He is philosophical, he is open to and intrigued by new ideas and loves to explore them. He is calm under pressure as well: he handles unexpected events calmly and effectively. 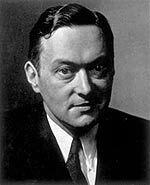 But, Walter Lippmann is also unstructured: he does not make a lot of time for organization in his daily life.